Free Shipping Included! Mogami GOLD AES-25 Digital/Analog XLR Microphone Cable, XLR-Female to XLR-Male, 3-Pin, Gold Contacts, Straight Connectors, 25 Foot by Mogami at Riot Recordings. MPN: GOLD-AES-25. Hurry! Limited time offer. Offer valid only while supplies last. Mogami GOLD AES Digital/Analog XLR Microphone Cables are intended for use in the most demanding high-end digital and professional audio applications. Mogami GOLD AES Digital/Analog XLR Microphone Cables are intended for use in the most demanding high-end digital and professional audio applications. Featuring a large gauge and extremely low capacitance, Mogami GOLD AES XLR Cables are superb for loss-free patching in both digital and balanced analog applications. Manufactured with adherence to the strict 110 ohm Audio Engineering Society (AES) and European Broadcast (EBU) specifications, Mogami GOLD AES Cables are designed with an Ultra-High Density spiral shield and impedance-matched for precise, noise-free data transmission. Use Mogami GOLD AES XLR Mic Cables for top-of-the-line connectivity with nearly any device equipped with an industry-standard XLR 3-pin input or output. Common uses include to and from mixers, preamps, amplifiers, audio interfaces, loudspeakers, powered speakers, studio monitors, and more. Mogami GOLD AES Digital/Analog XLR Microphone Cables are available in 3, 6, 12, 20, 25, and 50 foot lengths. 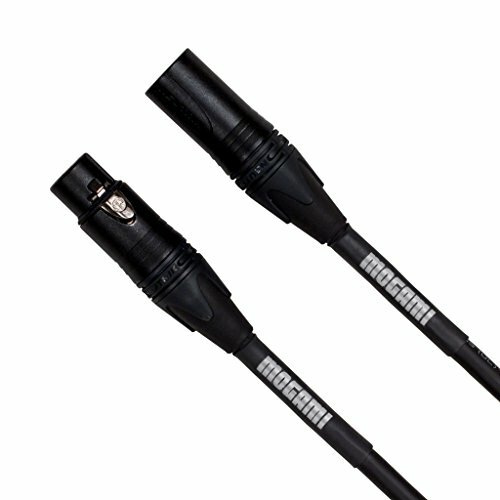 Mogami Lifetime "No Excuses" Warranty: all brand new Mogami cables include Mogami's Limited Lifetime "No Excuses" Warranty to the original purchaser and are proudly supported by Mogami and their dedicated network of Authorized Resellers. Please reference the entirety of Mogami Cable's Limited Lifetime "No Excuses" Warranty specification for complete details. Mogami GOLD AES Digital/Analog XLR Microphone Cables are intended for use in the most demanding high-end digital and professional audio applications. Featuring a large gauge and extremely low capacitance, Mogami GOLD AES XLR Cables are superb for loss-free patching in both digital and balanced analog applications. Manufactured with adherence to the strict 110 ohm Audio Engineering Society (AES) and European Broadcast (EBU) specifications, Mogami GOLD AES Cables are designed with an Ultra-High Density spiral shield and impedance-matched for precise, noise-free data transmission. Use Mogami GOLD AES XLR Mic Cables for top-of-the-line connectivity with nearly any device equipped with an industry-standard XLR 3-pin input or output. Common uses include to and from mixers, preamps, amplifiers, audio interfaces, loudspeakers, powered speakers, studio monitors, and more. This Mogami GOLD AES-25 Digital/Analog XLR Microphone Cable is a 25 foot length. The Mogami GOLD AES Digital/Analog XLR Microphone Cable series is also available in 3, 6, 12, 20, and 50 foot lengths.